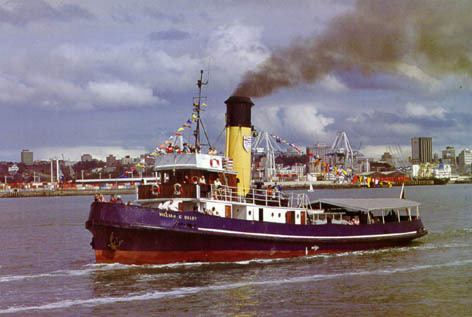 The twin-screw coal-fired steam tug WILLIAM C DALDY was built in Scotland in 1935, for the Auckland Harbour Board. She retired from the Harbour Board in 1977 and since then has been run by the William C Daldy Preservation Society. The vessel is normally moored at Devonport Wharf on Auckland's North Shore, and is steamed around the harbour on charters or public trips several times each year. 1935 by Lobnitz & Co., Renfrew, Glasgow, Scotland. Yard number 986. Two triple expansion steam engines, surface condensing. 980 Indicated Horse Power each. 110 - 115 revolutions per minute. 10 - Master, Mate, 2 deckhands, 3 engineers and 3 firemen. The WILLIAM C DALDY was named after the Auckland Harbour Board's first chairman. She was built in Scotland and delivered to New Zealand for the total sum of £30,499. 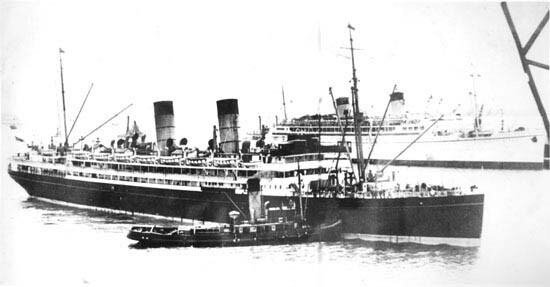 The voyage from Glasgow to Auckland took 81 days, calling at Algiers, Port Said, Aden, Colombo, Djakarta and Townsville. 26 Feb 1936, she made a trip to Tiri Tiri Matangi Island, with Harbour Board Guests, including descendants of William Crush Daldy. En route, she did a full speed trial, and her speed was measured at 13.8 knots - rather more than the 13.4 knots she had achieved on a blustery day on the River Clyde back in Scotland. Thereafter, the WILLIAM C DALDY settled down to her normal working life - assisting ships as they moved around the port of Auckland. She was assisted in this by the 1908 tug Auckland Harbour Board tug TE AWHINA. 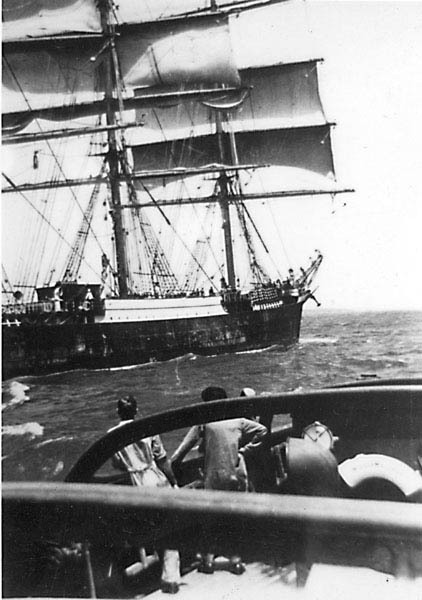 In the early days of the tug's working life, there were still occasional visits to Auckland by square rigged sailing ships. These would give the 'DALDY some of her longer tows, well out into the Hauraki Gulf. The 'Daldy was busy through the War years, with occasional 'rescue' trips outside the Waitemata. 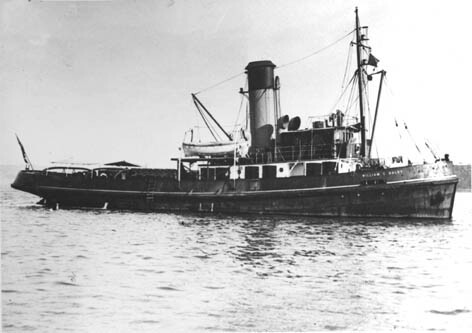 In March 1942 she was off North Cape, to take in tow the disabled tramp steamer SINGKEP and tow her to Auckland. June 1944 saw the 'Daldy once more off North Cape, where the steamer KOTOR was ashore. With help from the KAIMIRO, the KOTOR was refloated, but the WILLIAM C DALDY was then in trouble herself from the bad weather. With decks awash, the water in the bilges was rising, and she had to run for shelter, before eventually returning to Auckland. 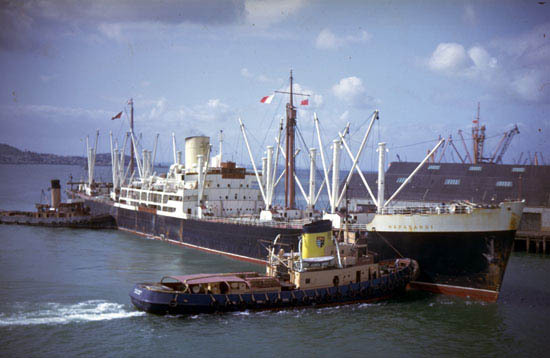 Life as a harbour tug continued for the WILLIAM C DALDY after the War, working with the TE AWHINA, until in 1958 they was joined by the new twin screw steam tug AUCKLANDER. The three tugs were kept busy with the large variety of passenger ships, cargo ships and tankers calling at the port. In 1958, the WILLIAM C DALDY came to the rescue of the Harbour Bridge construction project. As Engineers began manoeuvring a centre section on barges into position, it was caught by winds of up to 40 knots and became uncontrollable. 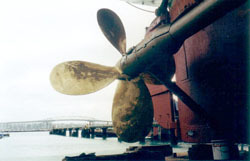 The WILLIAM C DALDY provided a sustained pull for more than 36 hours, holding the 1200 ton, 580 ft long section in position. The only serious mishap in the 'Daldy's career was in February 1975 when she was in collision with the Blue Star Line FREMANTLE STAR. The force of the collision moved the boilers in the 'Daldy about 6 inches forward on their seats. The 'Daldy was repaired. The boilers could not be moved back, so new seats were built for them, and they remain in their new position to this day. By 1975 the days of the WILLIAM C DALDY were numbered. 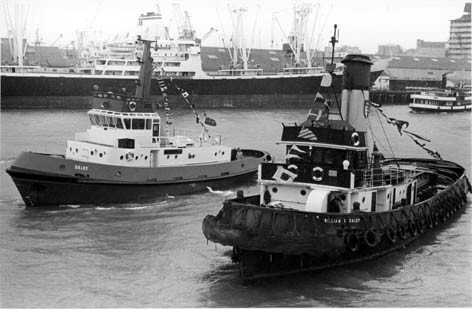 In March 1977 she was replaced by the new motor tug DALDY - built in Whangarei and with Voith Schneider propulsion making her much more manoeuvrable. 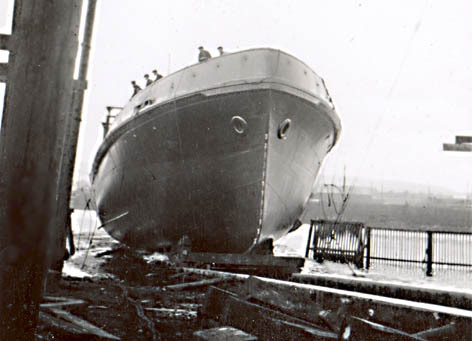 But, the new DALDY's bollard pull (the measure of a tug's pulling power) was only 24.1 tonnes - not a great increase over the WILLIAM C DALDY's 17 tonnes from 1935. The WILLIAM C DALDY was put up for tender by the Harbour Board, and a variety of offers materialised. In March 1978, a public meeting was held to gauge the interest in a project to preserve the 'Daldy, and this lead to the formation of the William C Daldy Preservation Society. The tug was initialy leased to the society, finally being sold to them for $1 in 1989. Summer 1980 saw the WILLIAM C DALDY back in steam on the Harbour, and since then she has been a regular part of the Summer scene on the Waitemata. 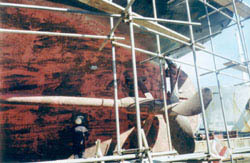 Charters and public trips help to pay running costs and repairs. 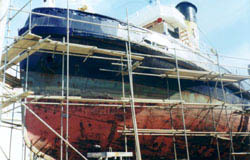 Sponsors have been generous in helping the keep the old tug in a good state of repair. Volunteers from the Society crew the tug, and also put in many many hours repairing and maintaining the vessel. The WILLIAM C DALDY is normally moored on the ferry wharf at Devonport on the North Shore of the Waitemata Harbour. The tug is owned and run by the Tug William C Daldy Preservation Society Inc.
She is in good working order, in survey, with a passenger certificate for 126. She is in largely original condition. Still coal fired, with original boilers, engines and steam auxiliaries. In the Summer season, she is active on the harbour, running charter trips and occasional public sailings. For the 2002-2003 Summer season, she will be particularly active, running trips to view the various Americas Cup races in the Hauraki Gulf. 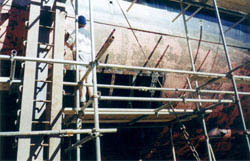 Hull plating removed for replacement. Hull plates have been replaced around the coal bunkers on the starboard side and alongside the engine room on the port side. The funnel casing has been replaced, with new internal flaps to keep the weather out when the tug is not in use. The vessel is crewed and maintained by volunteers - all members of the William C Daldy Preservation Society. If you can help, the Society would be pleased to hear from you. Volunteers come from all walks of life, and no experience is necessary - you can help fire the boiler, work on deck or help with the galley. The Society has a core of suitably qualified volunteers able to give training, and to meet the legal requirements for running the vessel. Left: Alex Franklin on the wheel. 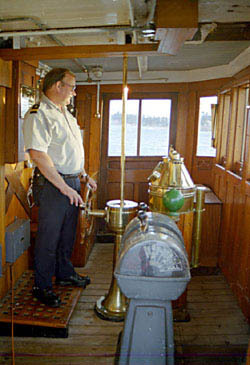 The wheel house is little changed, except for the engineroom telegraphs which were replaced in 1969. The controls are duplicated on the flying bridge above. Below: Each of the two boilers has 3 furnaces. 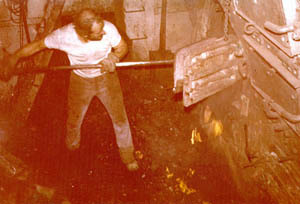 A steam-driven blower provides forced draught to the boilers. 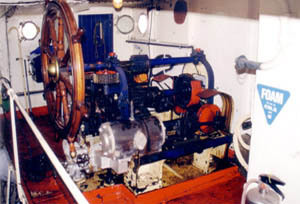 Above: Donkin's Patent steering engine at the after end of the engineroom The wheel is for emergency use. 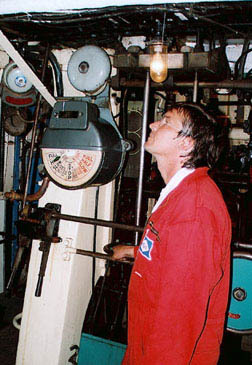 Right: Thomas Saecker at the starboard engine controls. The engine speed is set by watching the pressure gauge for the High Pressure cylinder receiver. The official web site on http://www.daldy.com contains more information with details of excursions, Charter arrangements, and information on how you can help keep the 'Daldy going. Many of the photographs used here are from the collections in the New Zealand National Maritime Museum - thank you to Rosemary Deane for her help in tracking them down. Other photographs are drawn from the display in the museum on board the tug. That display was originally prepared with the support of the NEW ZEALAND HERALD and the AUCKLAND STAR, and the Society thanks them for their photographic and editorial contributions. The remaining photographs are from members of the William C Daldy Preservation Society.